Utah is considering giving low-income residents the option to buy private insurance rather than expand Medicaid, says the Salt Lake Tribune. – Both plans cover 111,000 adults earning up to 138 percent of the poverty level — the same number who would have been eligible under a full Medicaid expansion. – One plan would use public funds to buy private insurance for residents with incomes under the federal poverty level. Those who earn between the poverty level up to 138 percent of the line would shop with federal subsidies on the exchange. – The second plan would use public funds to buy private insurance for all Utah residents earning up to 138 percent of the poverty level. Utah’s Legislative Health Reform Task Force recommended the two plans to the full state legislature. It also recommended a third option: doing nothing, which would keep Medicaid eligibility rules in their current state. 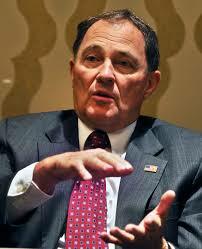 It is expected that Governor Gary Herbert will make a decision on expanding Medicaid in January, which will need legislative approval.